Communication, community engagement and preparedness are key as more National Societies use cash in emergency response. San Thida, 27, her husband and 5-year-old son survived, but they lost their home and all their belongings. In all, some 1.7 million people were temporarily displaced and almost 450,000 hectares (1.1 million acres) of farmland inundated. Water supplies were contaminated, latrines flooded and livelihoods interrupted or lost completely. Given the diversity of people’s needs, unconditional cash grants were judged to be effective to help people get back on their feet. Backed by an IFRC emergency appeal, the ICRC and additional funds raised domestically by the Myanmar Red Cross Society, unconditional cash grants were distributed in five of the 12 states where emergency operations were ongoing. San Thida used her cash grant to buy the land her temporary house stands on and install a well. She also bought some concrete foundation blocks to build a permanent home once her family can buy the rest of the materials they need. “If we hadn’t received [the cash grant], we would have had an extremely difficult time,” she says. A follow-up report on the cash transfer operation found a vast majority of participants agreed with San Thida — the grants had a positive impact on their recovery. 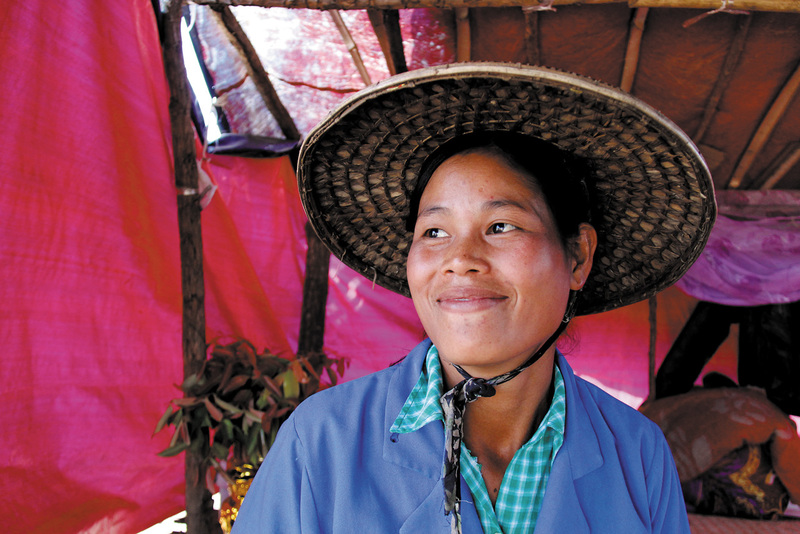 This was a gratifying result for the Myanmar Red Cross’s first widespread use of unconditional cash transfers in the immediate wake of a natural disaster. The National Society had used vouchers for livestock after Cyclone Nargis and a cash transfer project in Rakhine continues to offer conditional grants to small business owners. But as in many countries, cash as a form of emergency assistance is still a new concept here. For this reason, communication and community engagement were critical. Understanding local practices and communication networks ensured recipients understood important information and had a voice in the process, according to the follow-up report prepared by the IFRC, the American Red Cross and the Myanmar Red Cross. The Myanmar Red Cross’s ability to work with village recovery committees helped identify and select recipients, build trust for data collection and establish a feedback and complaint mechanism. The committees also helped address complaints and settle minor disagreements between recipients. The village committees also helped break down language barriers, as not everyone speaks Burmese, the predominant language in Myanmar. Because banners and posters describing the programme, and the selection criteria, could not be readily understood by all, the village committees could share information verbally. The overall aim was to put people at the centre of the response, provide timely and relevant information and foster trust and accountability by creating mechanisms for receiving both positive and negative feedback. Another key tool was a telephone hotline for receiving complaints or questions. Because this was a new programme launched during the emergency phase of the relief operation, there was limited time for capacity building of staff and volunteers. Some had received previous training, but many were introduced to cash transfers for the first time. Meanwhile, many volunteers were themselves affected by the floods, so others came in from elsewhere in Myanmar. Ultimately, the project was extremely successful, but all these factors led to some initial delays in implementation, assessment, distribution, monitoring and evaluation. For National Societies hoping to get cash out to communities quickly, the follow-up report recommends investment to ensure there is sufficient staff with the necessary skills to allow for a reasonable division of workload. This investment should be done in the disaster preparedness phase — with community involvement — so that communication and community engagement can begin well before crisis strikes. Mandy George is a community engagement and accountability adviser in the IFRC’s Myanmar delegation.